Protecting only the Gi Interface is no longer enough. Mobile networks are evolving quickly, and with change comes vulnerability. Until recently, the Gi-LAN connecting the (Evolved Packet Core) EPC to the internet was considered to be the most vulnerable part of the service provider network and was protected via Gi-Firewal and anti DDoS systems. The rest of the EPC links were considered difficult targets for hackers because advanced vendor-specific knowledge was required for a successful attack. Since the typical hacker prefers a soft target, defensive measures weren’t a priority for developers or carriers. Network complexity was a defense in itself. The need for securing the EPC is tied to advances like LTE adoption and the rise of IoT, which are still gaining speed. LTE networks grew to 647 commercial networks in 2017, with another 700 expected to launch this year. With the adoption of LTE, IoT has become a reality—and a significant revenue stream for enterprises, creating a market expected to reach $561.04 billion by 2022. The time to take a holistic approach to securing the service provider networks has arrived. The security challenges and the attack vectors are different on each link. Until recently, the link to the internet was the most vulnerable point of connectivity. DDoS attacks frequently targeted the service provider’s core network on the Gi Link. These attacks were generally volumetric in nature and were relatively easy to block with highly scalable firewalls and DDoS mitigation systems. The threat landscape is rapidly changing and attacks can come from other points of connectivity. This has been theoretical until recently; while numerous academic research papers have been published in the past decade suggesting that attacks from partner networks or radio access networks (RANs) were a possibility, those threats are no longer merely an intellectual exercise: they are real. At the same time, the rapid rise of IoT is exposing the threat of malicious actors taking control and weaponizing devices against a service provider. A10 Networks products defend some of the world’s largest telecom providers. Our S/Gi Firewall solution has been protecting large Tier 1 and Tier 2 operators, and our DDoS mitigation solution, TPS, has been deployed by many large service providers and public cloud infrastructures. These solutions can easily mitigate multi-terabit attacks. Now our offerings can do an even deeper packet inspection and advanced correlations at scale. We maintain stateful sessions for GTP, SCTP, and other related protocols to ensure that messages follow a standard path. Script-kiddies will no longer be able to easily generate simple flood attacks against your network. We inspect the flow and ensure that incoming messages conform to standards and all mandatory attributes are present. We have extensive filtering capabilities that can filter on message length as well as message fields. We can do deeper inspections and filter on information elements including IMSI and APN. In short, we have full visibility into the message so we can filter on any field of the message and block it. We can NAT outbound SCTP protocol through GRX networks. This creates security through obscurity by hiding the internal network details. With these powerful tools, we can detect and mitigate, or stop, a number of advanced attacks specifically against EPC. We can also do a granular deep packet inspection to protect against user impersonation by means of spoofing, network impersonation, and signaling attacks. 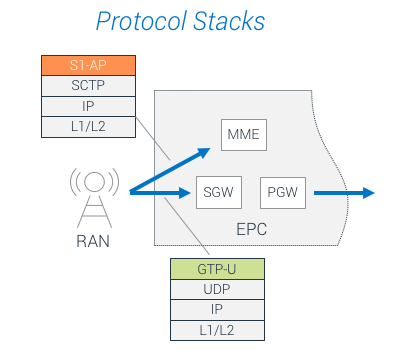 We understand and can parse all versions of GTP control protocols, SCTP, and Diameter. To summarize, in addition to mitigating and stopping terabit-scale attacks coming from the internet and providing stateful firewall services, A10 Networks is now upping the ante and can provide full-spectrum security for service providers to protect other connected links. Stay tuned for part two, where we will discuss A10's 5G-GiLAN solution and consolidation strategy. For more information on our service provider solutions, visit our website. An introductory guide to detect attack patterns and determine the mitigation solutions best suited for your organization.